One of the most popular games of strategy in the world, this solid-wood game will be popular at your house! The set features a hand-rubbed finished board, hand-carved pieces that conveniently lace onto leather cords for storage, and a detailed instruction booklet. 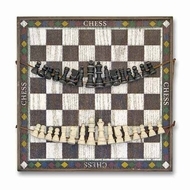 Heirloom quality, solid-wood game is crafted by hand and designed to either hang on a wall or decorate an accent table!